once lived in my current house! I’ve always enjoyed writing and found it came naturally to me. For a while I considered journalism. I did a Bachelor of Arts majoring in Literature straight after high school, then worked in the public service. It was when I was pregnant with my second child that a friend suggested we write a Mills & Boon together. The rejection letter came all too quickly, so we decided to write what we actually wanted to write! I never used to tell people I was working on a book, but I eventually became brave enough to show some friends. The feedback I had was very encouraging and I started to take my hobby more seriously. 2. Did you have many initial rejections, or did success come easily for you? I sent my first manuscript to two publishers and expected rejection. I received a wonderful email from Pan Macmillan on my birthday, but didn’t see it. The next day I got a phone call and was told the good news. They wanted to see the rest of my manuscript. But – here’s the twist. It was rejected! My story was a bit dated, too 1980s glamorous, but luckily they saw something in me that they liked. We discussed my future direction, I wrote another story and that was accepted. 3. How would you describe your genre? It can be largely categorised as contemporary women’s fiction. There are many subgenres, such as rural fiction and country town fiction, but my books are broader based and harder to classify. I tend to write about women with families, rather than young single women. I don’t worry about classifications while I’m writing. I simply try to tell a good story. 4. Do your books have similar themes or concepts? My books generally start with a woman facing a time of upheaval, when everything she’s used to in life is flipped on its head. They’re stories about women exploring their potential, and I always want them to have some hope. My women are flawed and make mistakes, but they grow throughout the book. I’m also careful not to portray men as jerks. I have three brothers and four sons, so I don’t like men being portrayed too negatively. 5. What comes first for you, character or plot? Usually I get an idea that I’d like to explore, some sort of issue or a problem. I create a heroine that I place in that situation. The early chapters of my books are about developing the main characters, moving them on from the setup. The plot then flows fairly naturally from that. I find that once my characters are formed, the book writes itself. 6. What is your writing schedule like and how long does it take you to write a novel? I’m not a morning person. I find 3 to 8 pm to be the best writing time for me. I think about a story for a few months before I begin to write it, and take about eight months to write each book. 7. You’ve recently released your ninth novel The Best Man. Can you tell us a bit about it? This is the first book I’ve written where the title just came to me, and the book developed from that. I started thinking, ‘Who is the best man?’ My main character Madeleine is a publicist working for a book publisher, who is about to marry an author. Everything seems set to go until the best man turns up! 8. Where is The Best Man available? You can get it in all book stores, as well as Big W and Target. You can also buy it online, for instance at Booktopia and Boomerang. It’s also available as an ebook. 9. Where can readers find out more about you? 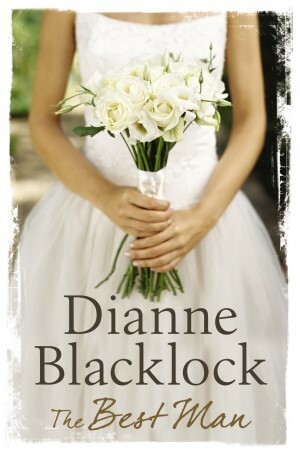 The best place to start is my website: http://dianneblacklock.com/. 10. And now the question no other interviewer can ask you – what do you think of what we’ve done to your old house? I’m glad to see you’ve still got a nice-sized garden. It would have been lovely to have had this house when we were growing up here! Thanks for having me on your blog, and in your home, Stella! What a fun story and what a delight to meet Dianne Blacklock! As always, thank you, Stella. Thanks Evelyne, I’m touched that you take the time to read and comment on my posts. Love yours too! A nice read….I have many memories of the Blacklock family home too as I met my hubby (Dianne’s brother) in 1980 when 5 of the 6 children were still living there. We had many a Christmas there as well as birthday dinners/parties, mum’s 50th, a farewell/engagement party in the back yard when Bob and I were heading off on an extended overseas trip and even a party following my son’s baptism. It’s great to read the answers to questions I don’t think to ask Di myself. Thanks Carolyn, it’s great to know that many people have fond memories here. It looks like you’re all still very close, which is wonderful! Is the toilet still outside under the backstairs? Hi Jenn, thanks for dropping by. Love your classification – I wish publishers would do that! Great interview with an inspiring author. I can’t wait for the hols to end to get into Dianne’s books. ← Are you an author or a writer?